This is so sad. You might have read that comedian Rechard Jeni shot himself. One of the funniest people in the country couldn’t deal with whatever he was facing and ended it all for himself. In my seminars and keynotes, I frequently have audiences who miss the crucial difference between the need to be funny (which I’m convinced is … for most of us… not important) and the need to have a sense of humor and be able to laugh at life. I don’t teach how to be funny; I teach how to enjoy the funny and how to take ourselves less seriously. Ok, so the point is that there is a crucial difference between the two. Need proof? Check out this story on Jeni. I don’t know him, and I have no idea what sort of pains he was dealing with. But I do know that he was (apparently) unable to take his troubles and lightly enough to see a healthy way out of his troubles. I’m so sad…. Do yourself a favor and go find something about which to laugh. 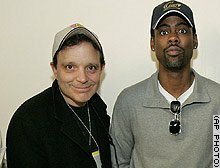 Here’s a photo of Jeni with his friend Chris Rock. LOS ANGELES, California (AP) — Richard Jeni, a standup comedian who played to sold-out crowds, was a regular on the “Tonight Show” and appeared in movies, died of a gunshot wound in an apparent suicide, police said Sunday. Jeni died at a nearby hospital. Jeni regularly toured the country with a standup act and had starred in several HBO comedy specials, most recently “A Big Steaming Pile of Me” during the 2005-06 season. What a sad and total waste. Learn about my funny motivational keynotes here. We can’t easily judge a person. Even with his profession as a comedian, There’s probably more to what he feels inside. Nobody can tell what you really feel inside. Why Are They ALWAYS Funnier? Pimped Out Toilet & Yoda Dog? What do they mean?